A recent outbreak of Phytophthora infestans, or late blight, in UK tomato crops is likely to be a new strain of the disease, as symptoms have been seen early in the season on young plants. Some existing plant protection controls are proving ineffective due to the apparent aggressiveness of this strain. The limited number of applications allowed for authorised protective and curative products for the disease during the growing season is also causing concern for growers, due to its early appearance. AHDB’s crop protection programme, SCEPTREplus, has responded quickly to the outbreak and will be conducting a trial this year to identify new potential options to control the strain. Introducing biosecurity measures and understanding cultural and environmental factors will also play an important role in helping growers to prevent and control the disease. Phytophthora are oomycetes, which are related to seaweeds and depend on free water for infection and spread. 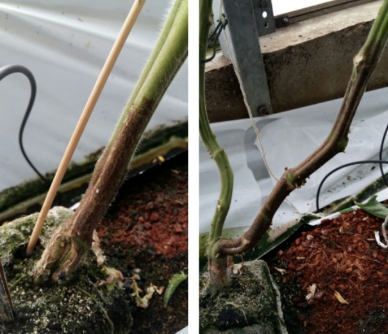 Symptoms of the new strain include brown stem lesions that start just above the graft union and spread along affected stems. As part of an AHDB-funded project to develop on-site diagnostic testing for oomycetes, Tim Pettitt, senior research scientist at the University of Worcester, visited a nursery infected with P. infestans to help staff better understand the disease and minimise the risk of spread. Information about the new strain, including symptoms, testing and diagnosis, biosecurity measures and cultural control options can be accessed here horticulture.ahdb.org.uk/phytophthora-infestans.